How do I apply EZ Street to a pothole filled with water? Just throw EZ Street directly into the water filled hole. EZ Street will displace the water. Then, compact the EZ Street with a shovel or car tire. Leave a slight crown on the patch because it will compact a little more as traffic goes over it. How long does EZ Street stay workable in a stockpile? 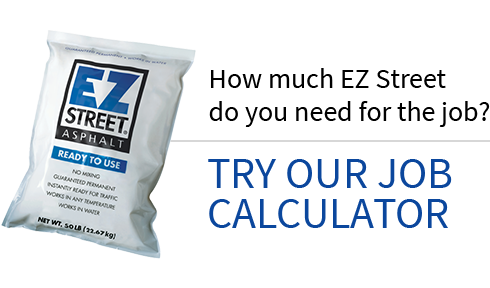 EZ Street is guaranteed to stay workable in a stockpile for at least 6 months in a 50-ton pile stacked 6' high. But we've had smaller stockpiles last over a year outside! If you leave the stockpile undisturbed for a long period of time, a protective crust may form over the pile. This is a built-in mechanism to prevent premature hardening of your stockpile. If this happens, simply have your loader "fluff up" the material prior to loading the truck. This will rejuvenate the EZ Street. What's so special about the EZ Street bag? The EZ Street bag is made of durable poly-vinyl that helps prevent breakage-a first in the industry. The bag is resealable to keep unused product fresh and has a nylon rope handle to make carrying EZ Street even easier. EZ Street lasts for at least a year in the bag…even if it has been opened and resealed. How long after applying EZ Street does traffic have to be diverted? EZ Street is ready for traffic the instant you throw it in the hole. In fact, many crews keep bags in their trucks so when they come across a pothole they can just throw it in the hole and let traffic compact it! Does EZ Street get harder to work with as the temperature gets colder? EZ Street is custom blended by our licensees for the specific region's climate. For example, our licensee in Oklahoma makes an open graded winter mix that stays workable in colder temperatures and a dense graded summer mix that performs better during the warmer months. How does EZ Street compare with regards to cost? 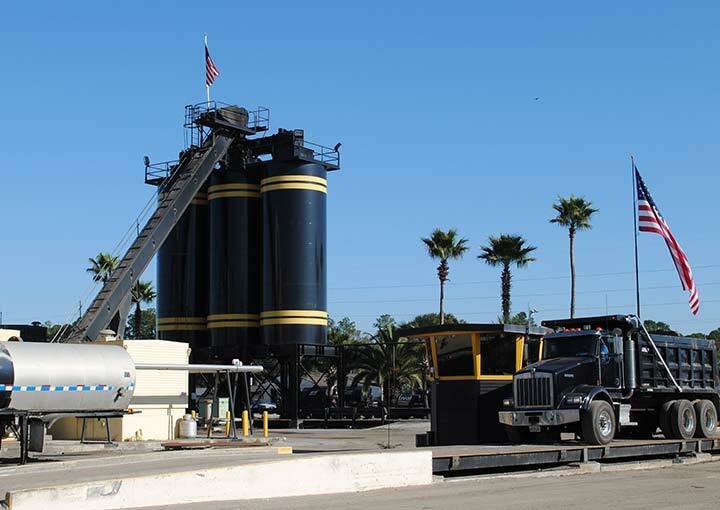 EZ Street is a premium cold asphalt that costs more per ton than hot mix or conventional cold mix asphalt. However, EZ Street actually costs less once all factors are considered. For example, say you are filling potholes with hot mix, first you have to wait in line at the plant, then you have to saw-cut the edges, clean the hole, and apply tack coat. Then apply the messy hot mix, roll it, and wait hours before you can open that area to traffic. Don't forget the wasted mix still left in the truck or the time it takes to clean it out. Conventional cold mix is a temporary repair. Not only are agencies paying to patch once, but with conventional cold mix, re-patching the same area is commonplace. For a printable pdf of these faqs, CLICK HERE.